Be ready for anything with Revolution Pro Conceal Kit. Featuring a high coverage and long-wearing formula that's creamy and blendable, it's the ultimate perfecting palette for photo shoots, weddings etc. Portable and all-in-one, this palette includes 24 shades in a mix for light to medium skin tones plus peach and yellow tones to brighten and correct. Explore the entire range of Concealer available on Nykaa. 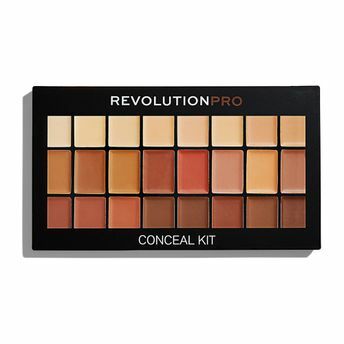 Shop more Revolution Pro products here.You can browse through the complete world of Revolution Pro Concealer .Alternatively, you can also find many more products from the Revolution Pro Conceal Kit range.